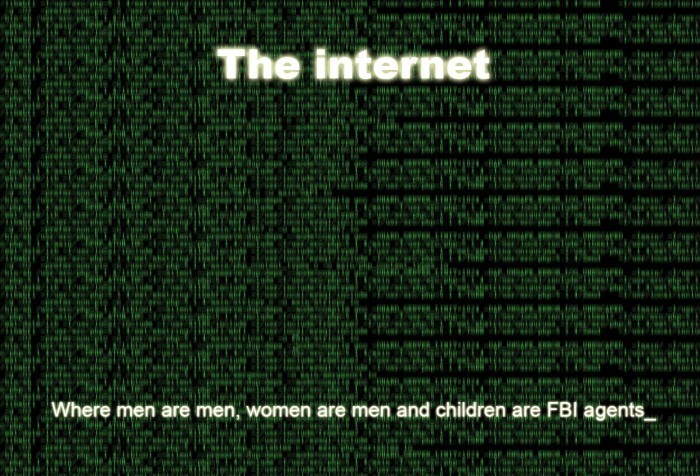 The Internet: where men are men, women are men and children are FBI agents. Now with fake Matrix text! Ah thx Malta, I was looking for that quote recently, I remembered I had read something like this years ago, but wasn’t able to find it. Anyone know the origin / who said it first? I think it was an IRC thing, but they might have only quoted it themself. You’re welcome 🙂 TvTropes attributes it to an anonymous person, so I guess it’s unknown who came up with it (tvtropes.org/pmwiki/pmwiki.php/Main/ThereAreNoGirlsOnTheInternet).